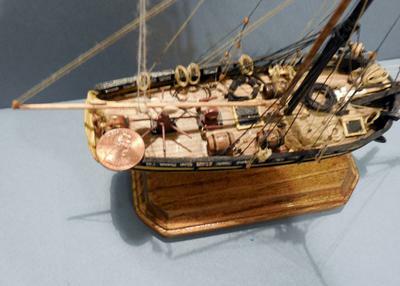 This is a miniature of an Anchor Hoy used by the US NAVY. The job of the Anchor Hoy was to set and retrieve the anchors of large warships in confined waters. When not handling anchors, the Hoy was used to resupply ships and to act as a dispatch boat. 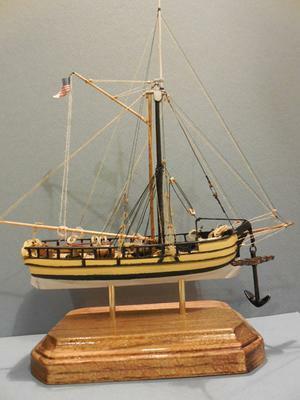 The Hoy was designed by the same man who also designed many of the sail and later steam warships of the USN. 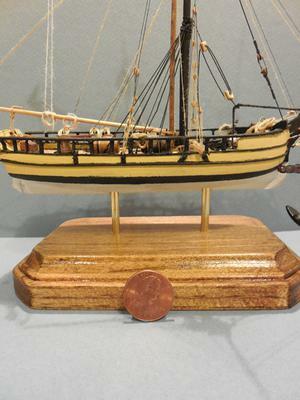 This 1/76 scratch built model is 5 inches long and is a solid bass wood hull. 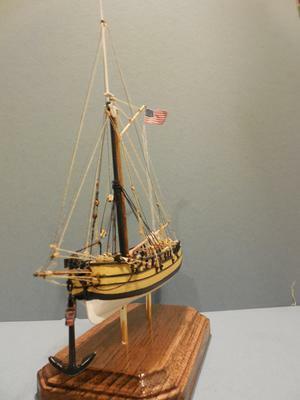 Everything with exception of the rigging line was scratch built from wood or plastic. Blocks were made by creating a scraper using cherry or basswood. The deck furniture is of Cherry. Not bad for a first ship and a first scratch build. David!!!! Good to hear from you. We decommed big D. Last year.